The cattle industry in Northeast Texas celebrated a milestone at the Sulphur Springs Livestock Commission Wednesday when the Northeast Texas Beef Improvement Organization (NETBIO) observed its 20th year of operation with a big barbecue luncheon, a board of director’s meeting and a preconditioned calf and yearling sale. The organization was launched in 1998 by a group of cattle producers and agribusiness leaders for the purpose of enhancing the beef industry in Northeast Texas. NETBIO is recognized as a leader in its reputable offering of pre-conditioned calves. The anniversary celebration Wednesday kicked off with a barbecue meal that was enjoyed by over 450 producers, buyers, family and friends. Following the lunch and prior to the sale, the annual NETBIO membership meeting was held. At the meeting the board of directors approved the financial report and elected nominees to fill six vacancies on the producer and agribusiness board. Elected to the producer board of directors was Stephen Gowin of Emory, a cattle producer and County Extension Agent of Rains County; Karl Ebel of Sulphur Bluff, a cattle producer and a member of the Nobel Research Institute Grazers Alliance, and J.T. (Tex) Nowlin, a resident of the Dike community, a cattle producer and a sales representative for ADM Alliance Nutrition. Elected to the agribusiness board of directors were three current members who were re-elected for another term. All from Sulphur Springs, they include David Black, DVM; Hopkins County Extension Agent Mario A. Villarino, DVM, PH.D., and Chris McClure, vice president of Operations for BeefTek, a livestock technology company. Following the membership meeting, Marcus Hill, a native of Sulphur Springs and current president and chairman of AgWorkers Insurance, spoke to the crowd gathered in the market center auditorium. Hill congratulated the members on the NETBIO program and encouraged them to continue their outstanding work to improve and promote the cattle industry in the region. 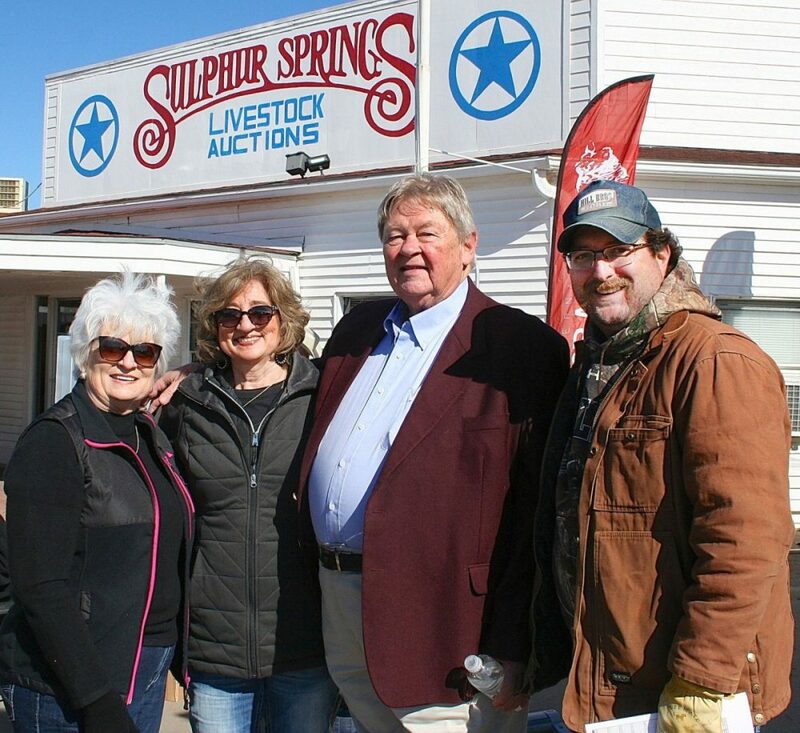 Marcus Hill, second from right, was the principal speaker at the NETBIO membership meeting held prior to the 20th anniversary sale at the Sulphur Springs Livestock Market. Pictured with Hill, a Sulphur Springs native, are from left, Patti Beckham, Connie Lott and his son, Blake Hill. Hill was born in Sulphur Springs, Texas and began his leadership journey in his local 4-H club at the age of nine. In High School, he was involved in student leadership by serving as Student Body President and as an Officer in the FFA. After graduation, he was elected Texas FFA State President. He took a year off of college and traveled all over the state speaking to high schools students, ag science teachers, businesses and civic groups. During his year as State President, he was able to meet and learn from great leaders, politicians and businessmen. He attended Texas A&M University graduating in 1971 with a Bachelor of Science Degree in Agricultural Education. He also worked towards a Masters Degree in Educational Psychology. While attending college, Marcus began working for National Farm Life selling life insurance and after graduation, he joined National Farm Life and its subsidiary, Agricultural Workers Mutual Auto Insurance Company, full time. Marcus became Vice President of Ag Workers in 1982, was appointed to the Board of Directors in 1984, and became President in 1988. In 2006, Marcus was appointed Chairman of the Board. Marcus is an Honorary Vice President of the Fort Worth Stock Show and is on the Calf Scramble Committee, he is past president of the 4-H Foundation Board, former member of National FFA Foundation Sponsors Board Member, a member of the Texas Agricultural Lifetime Leadership Advisory Board, is Chairman of Youth Activities Committee at the State Fair of Texas, a Former Advisory Board for Tarrant County College of Business, a member of the College of Ag. Dean’s Advisory Council at Tarleton, and a former member of the Texas FFA Foundation. Marcus runs a beef cattle operation in Wood County. After the meeting, auctioneer Joe Don Pogue gaveled into action the sale of 6,378 head of pre-conditioned cattle that were consigned by 225 producers. Auctioneer Joe Don Pogue calls for bids on a pen of cattle at the NETBIO 20th anniversary sale. 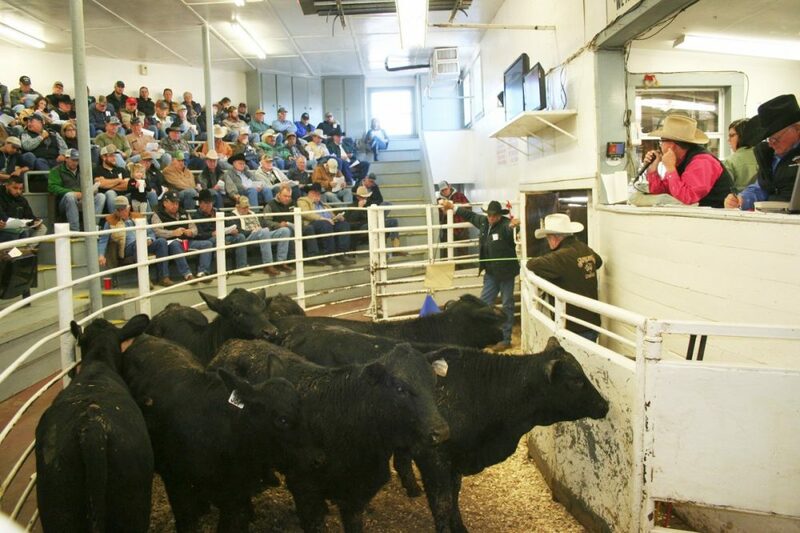 The cattle were purchased by 35 buyers at an average of $750.08 per head. Several hundred head were sold over the Internet. The next NETBIO pre-conditioned cattle sale will be held on Wednesday, January 16. The deadline for weaning calves for that sale is Dec. 2, and the booster shot deadline is Dec. 17. To consign calves and get ear tags for the sale, call 903-885-2455.